In December 1991, a two-volume edition of Dead Sea Scroll photographs was issued by the Biblical Archaeology Society, an American group headed by Hershel Shanks. It included an essay written by Dr. Elisha Qimron, an Israeli scholar noted for his work in the language of the Dead Sea Scrolls. Publication of this reconstruction and transcription resulted in a lawsuit in Israel and the United States between Qimron and Shanks. Piracy in Qumran analyzes this legal controversy, which rocked the scholarly world of Biblical and archaeological studies at the time, and which still resonates today. 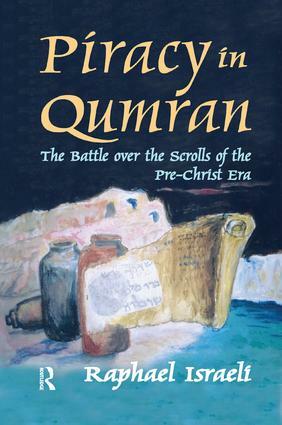 Qimron's long years of research so as to decipher one of the scrolls that dated from the years immediately preceding the Christian Era led him to revolutionary conclusions. He had controversial ideas about the ancient laws of purity of the Essenes, the authors of the scrolls, and their problematic relationships with the two main streams of Judaism. Read or reconstructed differently, this same text might yield very different conclusions. The emphasis in Raphael Israeli's volume is on legal and moral aspects of intellectual property law as it relates to works of historical reconstruction. There are questions about whether Qimron's work constitutes something original, the fruit of his creativity (and thus is copyrightable) versus whether it is merely a copy of an ancient blurred text, in the public domain, reconstructed by a modern author. This book does not simply take a position with respect to the matter of Qimron versus Shanks, it asks the reader to consider the controversy's implications for such topics as freedom of press. Although there are other books available about the Dead Sea Scrolls, no other study examines the social and cultural implications of this crisis in such detail. The story itself is intriguing for those who are not specialists in the subject, but are generally interested in the issues raised by the controversy. It will be of intense interest to scholars and students of religion or international law and historians of the Dead Sea Scrolls.